Randy Wilkins is a Hollywood veteran who’s worked on such films as "TRON: Legacy", "The Social Network", "The Girl with the Dragon Tattoo", "The Curious Case of Benjamin Button" and "Catch Me if You Can". We sat down with Randy to find out more about what he does and how he incorporates SketchUp (and our recently released Advanced Camera Tools plugin) into his workflow. Where did you grow up and where do you live and work now? I grew up in Ohio and moved out to Los Angeles to go to graduate school. I started working in the film industry immediately afterward. My favorite subjects were architecture, history and woodworking. Of the three, I decided architecture was the best career choice. That is, it was until I fell in love with cameras. I ended up dropping out of school to work as a photographer and by the time I returned to school I had decided to get a degree in film. I graduated with a Bachelor of Fine Arts degree in Cinema from the Ohio State University. During my senior year, my thesis film at OSU was selected as a finalist for a Student Oscar. That led to a Directing Fellowship at The American Film Institute. Primarily, I work as a Set Designer in the film industry here in Los Angeles. I realized that being an independent filmmaker is a tough way to pay the bills; luckily, I sort of fell into set design. It was a good fit considering my architectural , drafting and photography experience and it has allowed me to work in the industry while I pursue my own films. What projects have your worked on that folks might have heard about? I’ve worked on over 50 films and television series over the years. The great thing about set design is that you’re always doing something different and you’re always learning something new. I just finished working on "The Girl With The Dragon Tattoo" for Production Designer Don Burt, and I also recently worked on “The Social Network” and “TRON: Legacy”. I’d have to say “The Curious Case Of Benjamin Button” is one of the films I’m most proud to have worked on. I’ll always jump at a chance to do historical or classical architecture. I was also happy with the way “Catch Me If You Can” turned out. It was a very tough picture from our perspective. There were over 170 sets to create during a 70 day shoot. The fact that they were all period 1960’s and 70’s pieces made it a real challenge. How did you first hear about SketchUp? I first heard about SketchUp in 2003 when I saw another Set Designer using it. I was impressed with how simple it seemed to be to learn and how fast she could generate a model. It’s very hard for people who aren’t used to looking at orthographic drawings to be able to visualize them in three dimensions. We always used to build a lot of foamcore models, which can be very time consuming. To be able to quickly build something in 3D to show someone is a lifesaver when you’re working on a tight schedule. I started learning the program in 2004 but didn’t become really proficient with it until I took a class from Mike Tadros, which was great. He’s an excellent instructor. 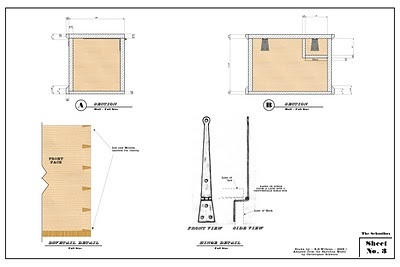 After that I was doing most of my preliminary design work in SketchUp and then executing the drawings by hand. 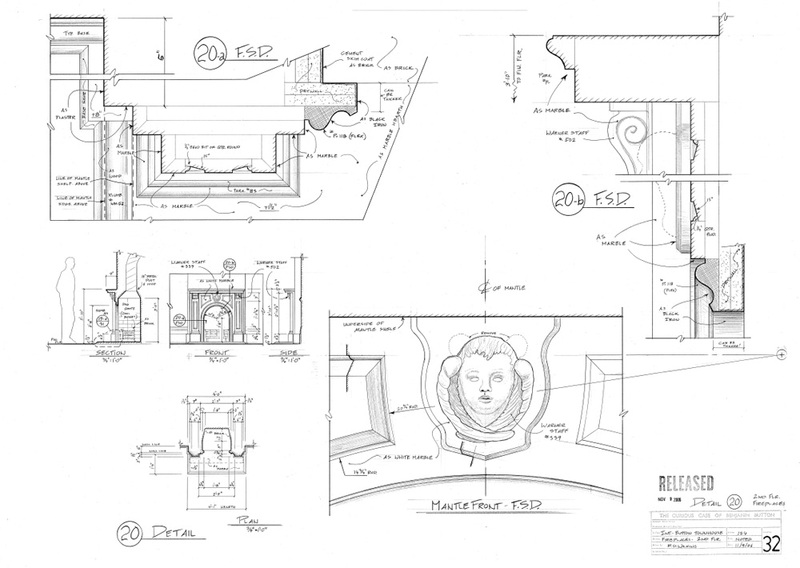 Until recently, most Set Designers were drawing by hand for a variety of reasons. 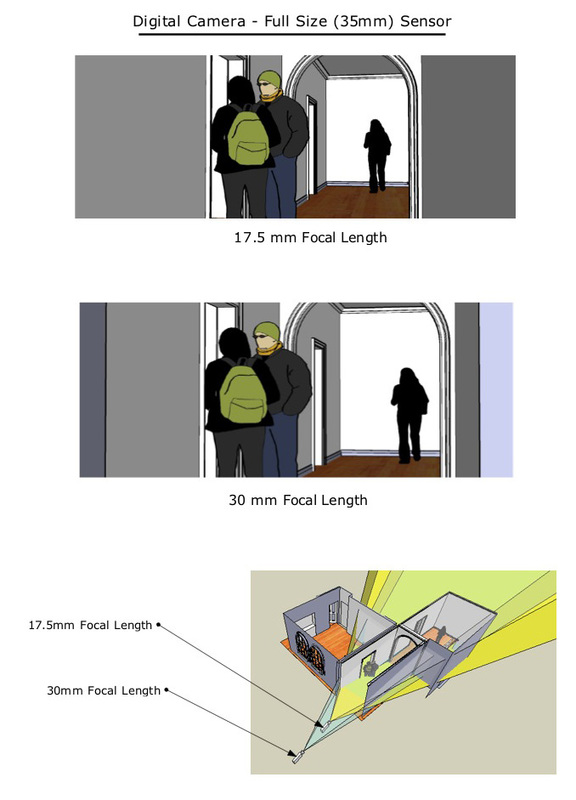 The image below is an example of a traditional drawing for film scenery. We often do a lot of character scenery that requires us to show age or organic shapes and that’s hard to do with AutoCAD. The next three images are good examples of some of the things I love about LayOut. I can add textures, shading or even paste in some of my hand drawings into the documents. They just have a lot more "life" than CAD drawings do. 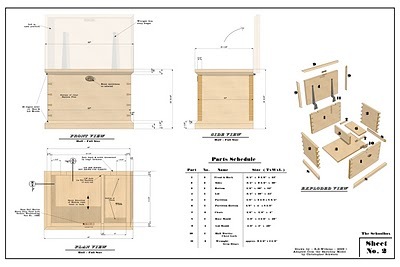 Measured drawings created in LayOut, based on a model by Popular Woodworking editor Christopher Schwarz. A drawing of the collapsing chimney from "The Social Network"
Since LayOut was added to Sketchup Pro, I pretty much do 95% of all my work in SketchUp and LayOut, and I’m always finding new ways to use it. 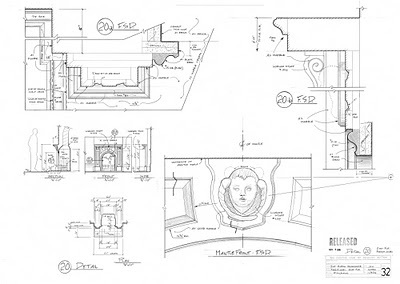 We have to create a lot of our drawings from photographs, either to recreate a historic building or furniture piece, or to match a location for sets built on stage or on a backlot. 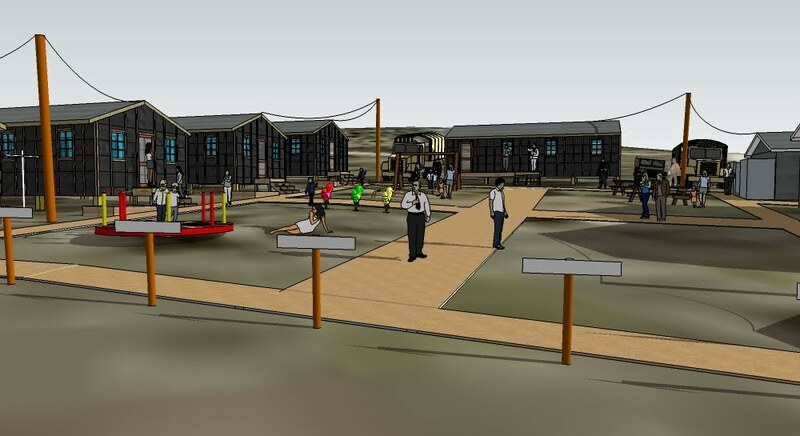 People are slowly realizing that SketchUp is much more than a modeling program. 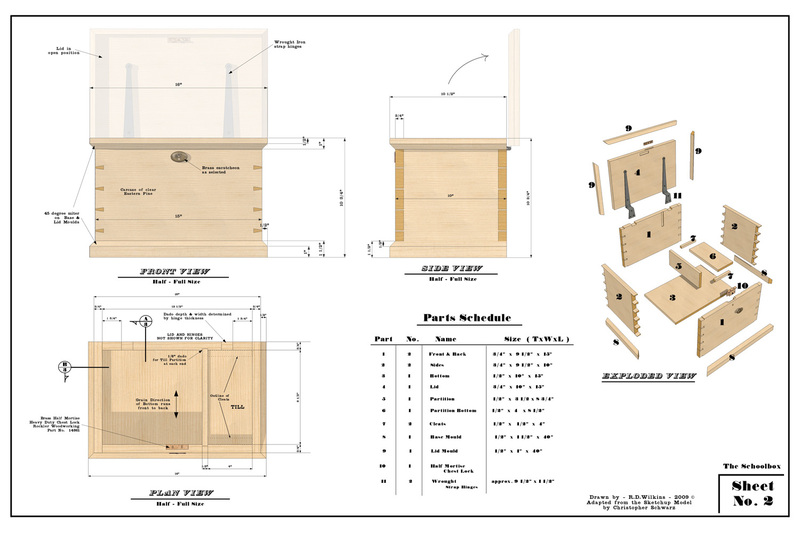 I still get surprised responses from some people when they see a drawing package I’ve done in SketchUp. I did some work last year for the television series “Glee”. 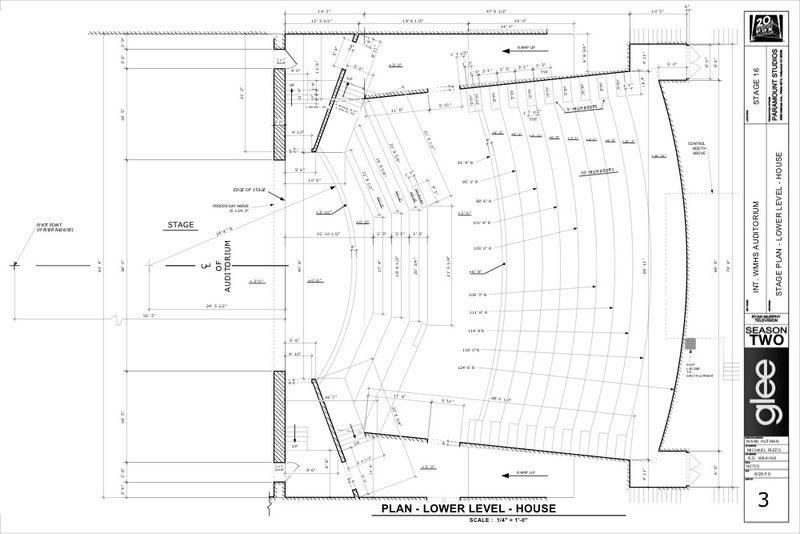 They wanted to recreate the theater they used for the first season, so I surveyed the location and modeled a slightly smaller version in SketchUp and executed the drawings in LayOut. The Key Grip looked at the perspective sections I included with the drawings and said, “What program did you do this with?” He was surprised when I told him it was SketchUp. 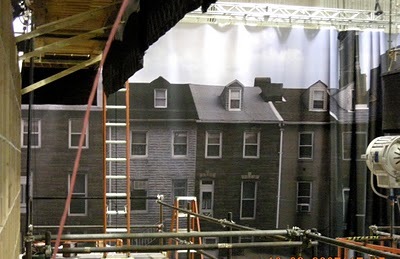 Perspectives of the theater set model from Glee. 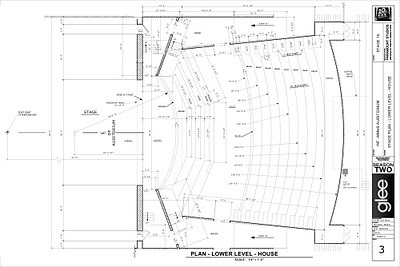 Plan view of Glee theater stage set. 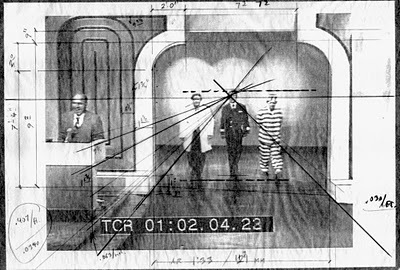 The film “Catch Me If You Can” opens with a recreation of a popular television show from the 70’s called "To Tell The Truth". Production Designer Jeannine Oppewall had me create construction drawings to build a replica of the original set that was accurate enough to matte-in portions of video from the original show. The original drawings were long gone and the only reference I had was a still from the video. 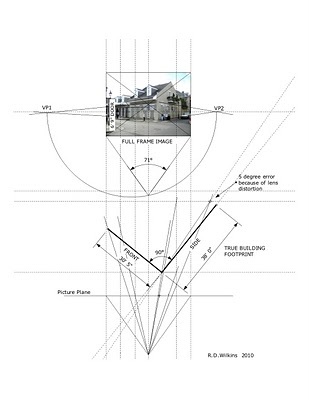 We have a technique called back-projection which basically uses the rules of perspective in reverse, as in Figure 5. From a photo we can figure out the scale to create measured drawings as well as determine the lens used, camera height and tilt and so on. I figured out it was much easier to do the process in SketchUp, where I could create the plan view right in the model, to scale (see below). An example of back-projection calculations in pencil. 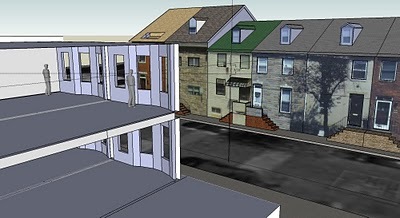 A back-projection done in SketchUp. I’m currently working for Darren Gilford who was the Production Designer for "TRON:Legacy" and is also a big proponent of SketchUp. He does most of his design work in SketchUp which makes it great when he passes his models on to the Set Designers. There’s no scaling or back-projection involved—I know exactly what he wants. Another SketchUp tool I use a lot is Match Photo, which is a nice companion to doing a back-projection. I’ve been using it to create models of buildings that no longer exist. I have a film called “A Question Of Loyalty” which did really well on the festival circuit and several people encouraged me to expand it into a feature -length film. It takes place in Germany and deals with the loss of civil liberties in the late 1930’s. It’s set mostly in an apartment of the Reitlinger House designed by the architect Friedrich Weinbrenner which was destroyed during World War II. 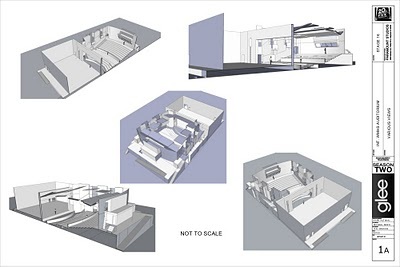 I used several period photos and Weinbrenner's original plan to reconstruct a SketchUp model to determine how much of the building needed to be a physical set and how much could be digital (below). 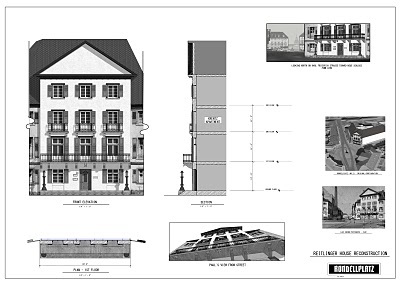 LayOut drawing of the reconstructed Reitlinger building. Is there a specific time you can recall when SketchUp was particularly important/helpful? There were several times while I was working on the television show "Heroes" that I really began to see the potential of the program. The show was very ambitious; it was like making a feature film every eight days. 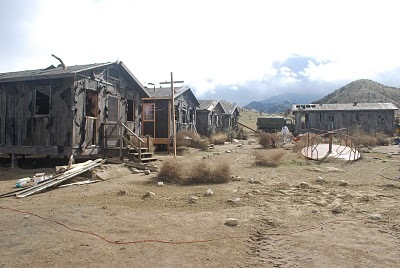 For one episode, we had to create an internment camp similar to Manzanar. We had three days to do the design and drawings and eight days to build it. After it was shot, the construction crew and painters had 14 hours to add 45 years of age. The Production Designer Ruth Ammon gave me sketches of what she wanted as she was leaving for the location scout of the build site. 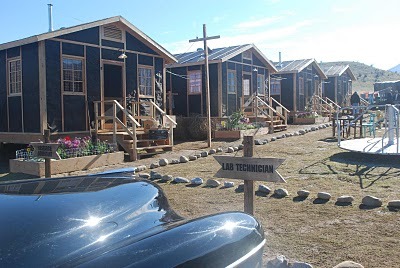 I asked her to send me the GPS coordinates of the center of the camp and a photo showing the orientation. By the time they got back from the scout I had downloaded the site with the topography from Google Earth, dropped the camp model onto it and laid in the new road. It saved me at least two days. 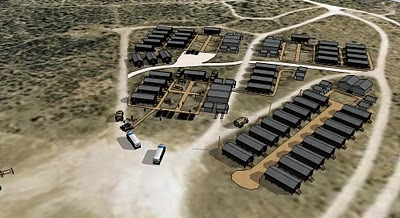 SketchUp model of camp for "Heroes"
The program is also great for designing photo backings or translites for stage work. 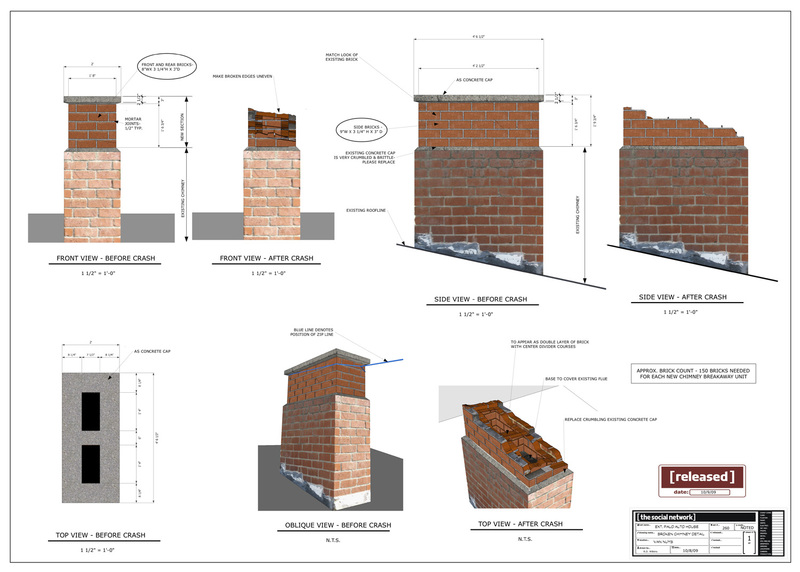 We used to lay them out on paper but doing them in SketchUp is great because there isn’t any guess work. You can "paint" the photos of the location on the wall outside the model at the right scale and show the Production Designer exactly what it will look like. A layout for a photo backing. How are you using the Advanced Camera Tools plugin in your work? I’ve been hoping for an update to the old Film & Stage plugin for some time now and was really excited to learn Google was working on it. It really was the missing piece of the package for me. I can now say that SketchUp really is the perfect software for film design. There is very little I can think of that I can’t do with it. When you have a digital model up on the screen, the first thing a Production Designer or Director or DP will ask is, “What focal length is that?” Because the most important thing really is: What is the camera going to see? Everything else for us is secondary. If it can’t be shot it won’t work. I had a work-around process for using camera angles that I’ve been using but it’s cumbersome. The new Advanced Camera Tools plugin is fantastic. I can change the focal length while in the camera mode and not have the camera move its current position, or I can change the aspect ratio or tilt or height without having to reposition anything. And having the data right on the screen is a big help. This means SketchUp is now very useful for the other two "VIS's". In the industry, visualization is now broken up into three parts: D-VIZ (Design Visualization), PRE-VIZ and POST-VIZ. 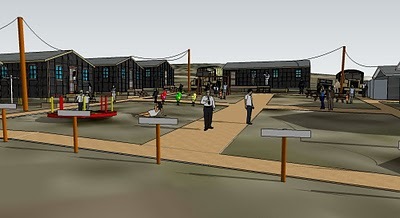 D-VIZ is the traditional pre-production design phase where the sets and environments are created and SketchUp is already the most-used modeling program in that respect. Pre- and Post-visualization are more concerned with exactly what is seen through the camera and combining real and computer-generated elements. With the Advanced Camera Tools, you can now view a model and be very specific as to camera position, aspect ratio and lens focal length. That for me was the missing piece of the software. What advantages does it give you over other similar programs? For a software package that would give you the same ability to use specific camera data and lens data you would have to consider a much more expensive program. To get data and camera control comparable to the new Advanced Camera Tools I would have had to bring the model into another program such as Maya or Rhino. Now I don’t need to go to that trouble. It also suddenly becomes a very much more useful tool for storyboarding. There are a number of programs such as Frame Forger that are popular 3D storyboarding programs because they provide specific camera and lens data. You now have all those capabilities with SketchUp. And when you create those boards in LayOut, they are automatically updated when there are changes to the model. That’s a huge advantage. I’m going to begin teaching seminars on Visualization For Filmmakers (email if you're interested) here in Los Angeles and almost all of the curriculum has been created in SketchUp or LayOut. The ACT plugin will be very useful for the sections when I’ll talk about both lenses and digital storyboarding. What would advice would you give to aspiring set designers and filmmakers? I always recommend that people who want to direct take an acting class such as the Judith Weston Acting Studio, which is excellent. You’ll have more empathy for actors and it will be easier to communicate with them. Even if you want to make animated films or create CG characters, understanding the acting process and character development will make your digital characters more emotionally real. Learn about what the camera does. The book "Film Directing: Shot by Shot: Visualizing from Concept to Screen" is a good resource, as is "Digital Moviemaking 3.0". Make short films. You used to have to go to film school just to have access to the equipment you needed to make a good looking film but not anymore. Today, all the equipment you need to shoot and edit in your own home is affordable. Traditionally, Production Designers got their start as Art Directors or Set Designers, but now they come from all fields: illustration, product design, visual effects and others. The Art Directors Guild publishes a magazine called Perspective which is available online and contains articles about the design of current films. You’ll need to be able to communicate visually, which means drawing and modeling are both very useful skills as well as the ability to read architectural drawings. Study architecture, design, history, technology. There’s nothing you’ll learn that won’t be useful. The Production Designer, to be really effective, should know the basics about all the other aspects of film making. As a woodworking, I found this post very interesting. 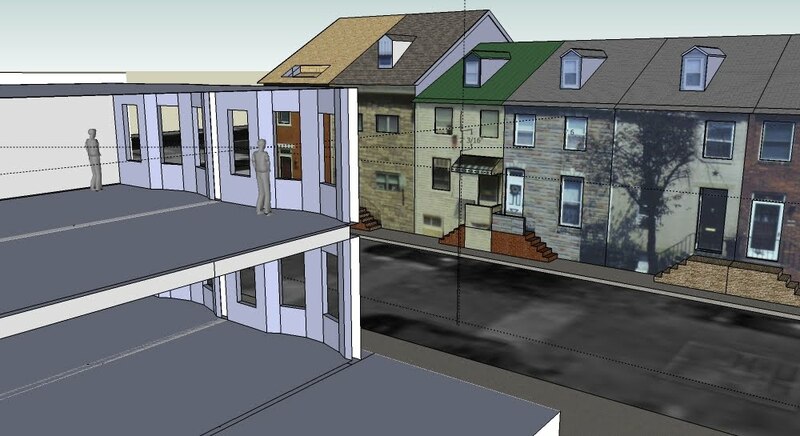 It helps me see the potential of SketchUp as a key tool in project design. Thanks for the post. Great article. You've always been a good pitch-man for SketchUp and your talents using it show how efficiently the program can be used within the film world. Keep up the good work. This is too awesome. Makes me feel like a career switch. Thanks for sharing! The link to email about more information on the "Visualization For Filmmakers" seminar is broken... any way to find out more about this? I fixed the "email" link on the post. Sorry for the inconvenience. hi, I've done something similar with sketchup. I did a lot of modeling for a dinosaur theme park, something that used to be done with more sophisticated software, but I managed all this in sketchup and everybody is happy with the result. Astounding! Just tweeted about your models. Contact me for a case study, please: aidanc at google dot com.